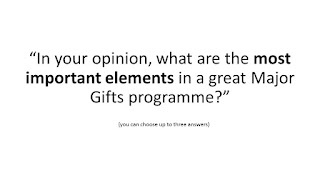 Our number one element with 18 votes is a GREAT Major Gifts programme according to 25 Major Gifts fundraisers is…. Great projects. Tied in second place are a good prospect pool and leadership. 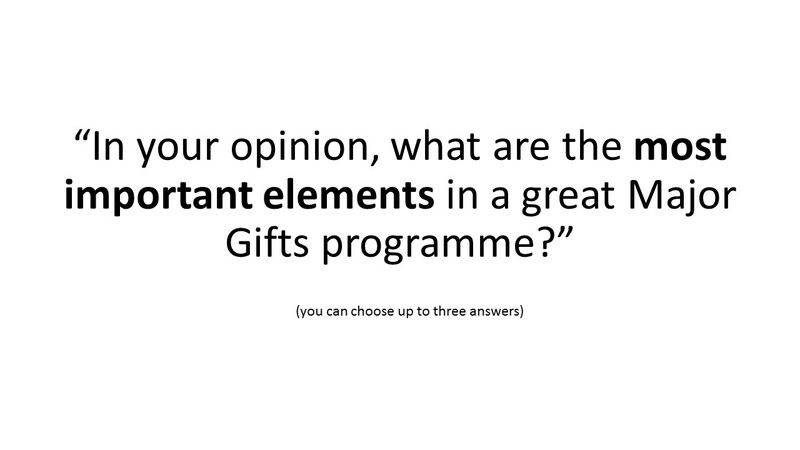 And in fourth place with 15 votes… our number four element is Skilled Major Gifts fundraisers. I'll explore the implications of that later. First, let's move onto our next survey question. In first place with a massive 21 votes, 84% of people surveyed felt that uninspiring / badly thought out projects were the biggest barrier to success. Tied in second place are poor leadership buy in and insufficient prospects. And in third place- under-skilled or in experienced fundraisers. Great projects are the number one key to success and poor projects the number one barrier. Does that resonate with anyone here? Meeting one to one and probe further. Pushing to get your colleagues to think bigger and to get a better sense of what is unique and ground-breaking. You HAVE to be willing to be the little boy in the Emperor's New Clothes. If you think something is missing then you have to point it out and proactively work in partnership with your colleagues to shape the project and its case for support into something which is fundable. You can’t be passive. You have to be an active agent, involved, discussing, mapping out, brainstorming and being a critical friend. You can see suddenly, why Leadership Buy in is so very important. Having leadership buy in isn’t just about having someone who can sit in at an ask meeting. It’s having someone who will listen to your advice and encourage other people to work with you the way you need to work. Peer to peer mentoring. If you’re working in a big organisation and you’ve worked with a number of different groups peer to peer mentoring can be really successful. For example, when I worked at a large university, we arranged for a group of academics who had successfully got a research centre off the ground, to share their learning with a group of researchers who wanted to do the same. That helped to build trust and credibility. Communicating to them with the information they need in the way they need to hear it. Understanding what information your leadership team or CEO need to hear is important in gaining buy in and influence. That could be providing reams of evidence and analysis, showing in numbers what you know to be true. It could be providing peer benchmarking to show your relative progress against your nearest competitor. Instead of complaining about the fact they don’t listen, provide what they need to hear. External voices. This could be getting a consultant to provide a report telling your CEO what they need to know. It could be getting them to go on a course to learn about fundraising. It could be lunch with a donor, so they can hear direct from the horse’s mouth. Of course it’s easier to provide a donor to lunch with your CEO if you have some prospects. It’s also easier to fund a project or a programme if you have someone to whom you can go for money. Yep, the other key to avoiding Impossibly Monstrous Projects is feasibility. 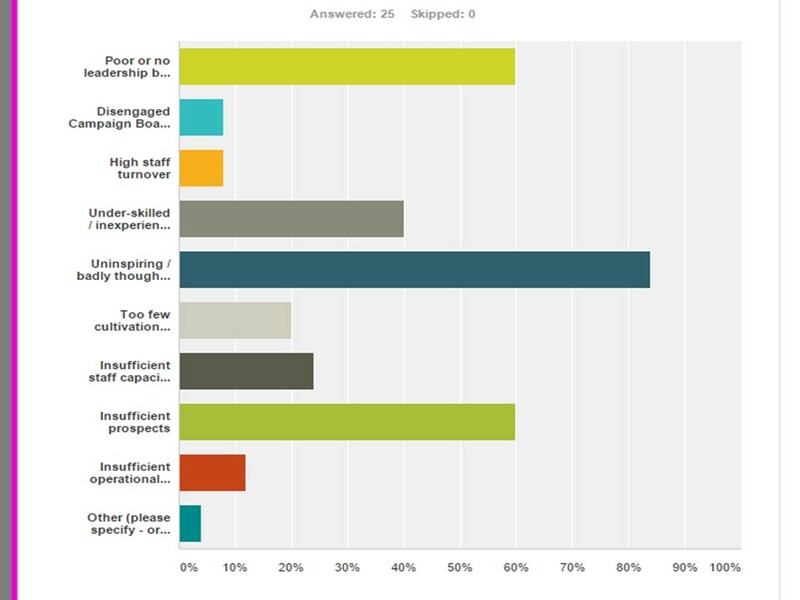 If you don’t have enough prospects you either find some or you agree that the project isn’t feasible. Research e.g. looking for gift capacity, inclination, strength of connection. 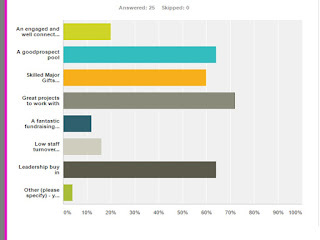 So back to our survey. 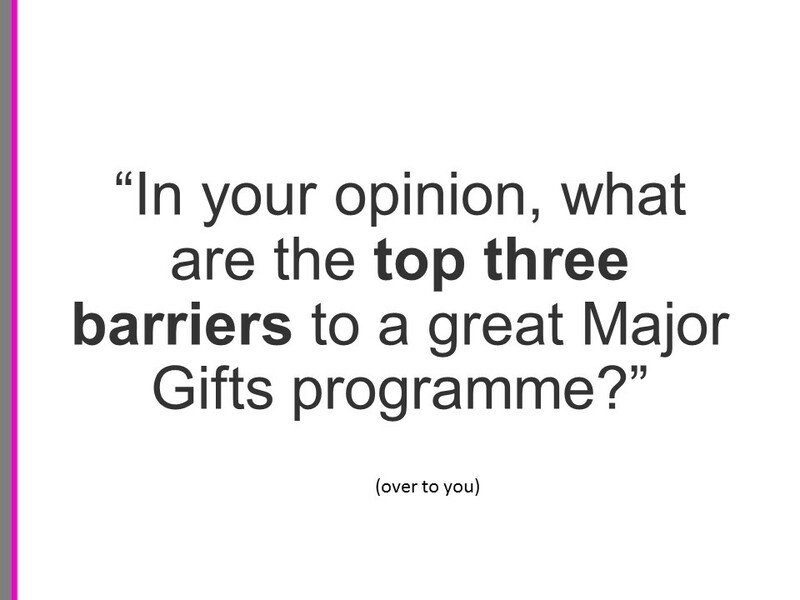 We know what the biggest success factors and the biggest barriers are for our Major Gifts programme, but what about for YOU. Your own personal performance. By far and away the single greatest barrier to Major Gifts success is not meeting enough prospective donors and donors. A wise fundraiser once said to me that Major Gifts is like a marriage. You don’t commit on the first date. You have to get to know each other. Well, if you don’t ever meet anyone you don’t get to have that date in the first place. Meeting people is paramount. We’ve already talked about where you find your prospective donors. Once you have found them, what do you do with them? 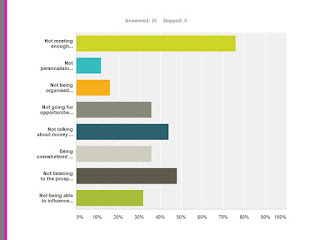 The answer is not to invite people to endless events. Cultivation events are nice but they don’t raise money. Asking for money raises money. But getting those meetings and talking money can be quite daunting. 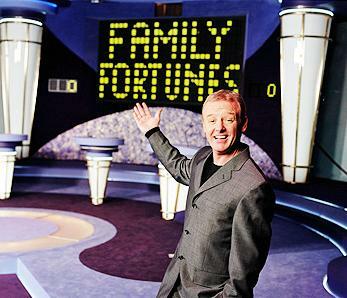 When you’re faced with a sea of prospects, how do you make the first move?